Made of 100% US Grown Green Cotton and Pure Wool and it comes in 3-inch thickness. We recommend this stowaway to be used on the floor or a flat surface. Not recommended to be used with bi-fold or tri-fold frames. 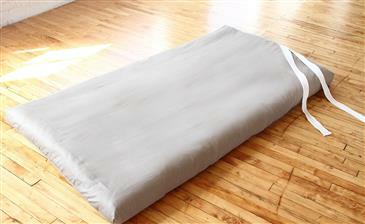 These mattresses bi-fold, tri-fold and roll up. Flame Retardant: Pure Wool Here is some info from our wool provider.